How do loft conversions increase the value of your home? Are you considering a home improvement to boost the value of your property? A loft conversion may seem like a big undertaking, but it can reap rewards by increasing the selling price of your home as well providing extra living space for your family. Whilst the initial price of this alteration may put you off, the great benefits it can offer are well worth the primary investment. In this simple guide, we’re going to be exploring how loft conversions increase the value of your home, and helping you to get started on your journey. There are many factors that motivate homeowners to transform their loft spaces. The primary driving force is often a need for more space, combined with the lack of funds to move the family to a new home. 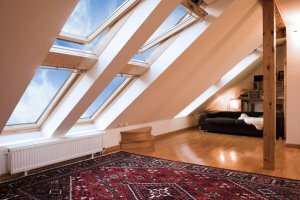 Converting your loft is often an attractive option as it utilises an existing area and revamps it to create an extra livable room in your home. Your empty loft can be upgraded to fulfil many purposes, including; bathroom, bedroom, home office, chill-out zone, gym or playroom. But another big advantage of a loft conversion is the value it adds to your house. Recent research conducted by the Nationwide Building Society suggests that a loft conversion can increase the value of your home by up to 20%, as buyers are often prepared to pay more for extra usable space. If we delve further into the research, we see that, in general, an additional bedroom can add 11% value to a selling price, and a bathroom can add 5%. These statistics are good news if you ever move property, as there will be a decent pool of money to play with when it comes time to sell up. Before beginning your project, consider the size of the loft you have available, and decide whether it is big enough for its intended use. You will also need the floor’s strength to be assessed to ensure it can take the weight of the intended build, otherwise reinforcements might be needed. Measurement-wise, there are three figures that need to be accurately noted to assess suitability; head height (no less than 2.2 m), pitch angle (no less than 30 degrees) and footprint of the room (no less than 5.5 m x 7.5 m). For more detail about these measurements, see our full guide to loft conversion measurements and suitability. How do I begin a loft conversion? The keys to a successful loft conversion are planning and creativity. Planning permission is often not needed, but you will always need to secure Building Regulations approval to ensure that the planned project will be structurally safe and thermally efficient. Work alongside your chosen architect or designer to draw up both imaginative and functional ideas. Consider placement of elements such as lighting, staircases and partition walls, as they can all make a difference to how effectively the room performs. The most important stage is to hire the services of a professional conversions company who can bring your ideas to life. Companies such as Kingsmead Conversions have a team of builders, craftsmen, architects and designers, all of whom are dedicated to delivering high quality results for their customers. For top-notch loft conversions in Milton Keynes and surrounding areas, look no further than Kingsmead Conversions. We employ a wide range of trained professionals in various specialities, ensuring that every aspect of your project is delivered to high standards. Our fully accredited company has been operating since 1999, and these years of experience are reflected in the quality of our work. Get in touch today to find out more about our comprehensive services.